In the summer of 2008 we visited my wife's relatives in Kelowna, British Columbia. It was a rainy day on our flight out. Here's a couple of planes waiting to take off from Vancouver. In Kelowna my brother-in-law took us out in his boat. His son flew through the air as he jumped in the lake. A couple of years ago I was lucky enough to spend a couple of winter weeks in Maui, Hawaii. The next two pictures look like they were taken from a plane but, no, they were taken from the highest elevation point on the island, above the clouds. A little closer to home, we had a couple of visitors in our pool last spring prior to swimming season for a couple of weeks. Then they took off. And finally, Labour Day weekend I took my wife hot-air ballooning for her birthday. It was the most amazing hour and-a-half we'd ever spent. 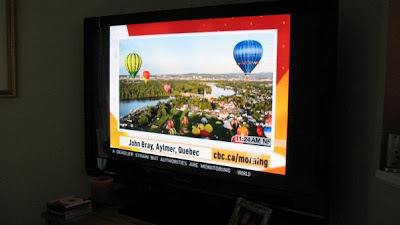 The balloon was sponsored by the CTV television network. Following our adventure I submitted one of my photos to CBC Newsworld's News Morning and they used it as their photo of the day. So we started our adventure with one TV network and finished with another! Here's a couple more pictures. In the words of Joe Cocker, we were up where we belonged. And for my pals at Humor Bloggers Dot Com, I always thought Chester was full of hot air! Wow, I loved all your flying photos! I've been on a hot air balloon ride...there just nothing like it, huh?! Gorgeous photos! Great way to illustrate today's theme! I'm so jealous because I've always wanted to go up in a hot air balloon. If I get any higher than 6 feet in the air, you'd have to have a cleaning crew available to pick up all my poop. Betsy: You're right there is nothing like it. It's so still up 1200 feet in the air at 7am on a fall day. CatLady: Oh, you'd love it. moooooog: You must be a real joy on the trampoline. my boys love the balloons and watching them float over the house each year...have never been up in one though...there is a sign nearby advertising rides...perhaps we may try. happy tt! Wonderful photos Noname! You inspired me (no NOT to go hot air ballooning, I'm too bak, bak, bak, bak!). Brian: We were really lucky to be part of the annual balloon festival. Our ride was cancelled the week before due to bad weather so we were re-scheduled on the date of the festival. Quite cool. hah! Great pics and great anecdotes make up one high-flyin' post! Sweet! I almost did a post on hot air ballooning too. It's amazing. The last one I did was over the Serengetti in Africa; got to watch lions and elephants from above. Truly one of the most incredible experiences one can take in. Good choice for TT! The photos of the hot-air balloons were wonderful! Just wonderful! Amazing hot air balloon photos. Stunning. Really. NoName, this is weird, because I mentioned flying today, too. *insert creepy Alfred Hitchcock music here* Those balloon shots are amazing, and what's even more amazing is that you got them on a competing network. Wings: How appropriate you would flit from site to site today! VE: I have a friend who ballooned over the Serengetti. She crashed and had a few anxious moments with those lions and elephants. Must be quite an experience. AngelMay: I took close to 200 pics that morning. It was fantastic. e: Thanks, we really enjoyed ourselves. Gorgeous pictures! I remember the Labor Day ballooning adventure, but what's with your name pasted across the bottom of the flat panel t.v.? Are you famous? Should I get your autograph? Don: Yeah I know CBC outed me. I had to give them my real name to submit the pic that was broadcast across the country! Theme Thursday? Do you all get together and decide on a topic? I just left "Skip's Stuff" and he's flyin' high too. The things you miss when you're away for awhile. Anyway, I love, love, love the hot air balloon photos. This is another item on my bucket list, although I think I'll go for the tethered ride. Excellent photos but those planes, that rain . . I'd be wetting myself. The balloons are marvellous. So many. I get the odd one floating over the roof in summer very early in the morning! Me-Me: That's exactly what it was: a bucket list experience! I discovered http://themethursday.blogspot.com/ (hyper link at end of post)through VE a while back and have been participating ever since. Baino: Yeah the rain on our take-off was a little unnerving. On the balloons, ours was one of 80 entered in the local annual balloon festival. Nice photos! I love the Maui shots. You got a great view of the Big Island! One of these days maybe Hubby will get me up in a balloon. Yes, I'm terrified. Never had the gumption to go up in a balloon. Maybe someday, when I don't care if I die. Till then . . . nah. Wonderful pictures. I really like the one of the Jester balloon. RG: The air was a little thin on that Maui mountain top. DK: You'd love it. Beats bungee jumping. That I'd never do. Jayne: Thanks, there are many aspects to "flight". noname, good take and awesome snaps! I was once on a balloon chase team. Didn't get to fly but ended up travelling over 400 miles to catch ours! Fun! subby: Neat. Our pilot was in constant contact with his chase team and they were waiting for us when we landed. subby & Dreamhaven: Not to put you guys off but there were 9 other people in the balloon basket with us and yet we managed to soar to 1200 feet. It was an experience I'll never forget. I don't think I could get on a plane that small when it was raining. But I'd love go to up in a balloon. How lucky were you, to get rescheduled?!? Megan: I've been on smaller but that day our plane was larger than those two. Oh yeah we were estremely lucky to be rescheduled to the weekend with the festival.